This page is a continuing, "re-cycling" feature in COMPUTE!. It consists of a set of articles that repeat, in sequence, across issues. Thus, if you're a beginner to computing, you can pick up the series whenever you start with COMPUTE!, and within four or five issues, have the set. By then, you'll find you've advanced far beyond where you are now, especially if you have your hands on a computer. If you're just getting started, you'll find several important sources of information are available to you. Beyond the obvious channels, such as magazines and books, you'll quickly discover a community of users. Your local computer store can help there. They can frequently specialize in, or at least cover, your particular computer. Depending on the size of your user community, you may even find seminars for beginners, a lending library of back issues of magazines, and so on. If you're in an area where activity hasn't yet grown to the point of established clubs, or there's not a computer store around to provide such information, drop a note to your machine's manufacturer or give a call to the district office. They may be able to provide the names of some clubs in your region. Assuming you have no experience with computers, and no established local users group for support, where do you start? Well, you have the manuals that came with your computer. And depending on the manufacturer, you'll find there are several good books on BASIC programming around that will help. One sure method of plunging in is to take some of the simple programs that we present here, for example, and use them. Once you've entered a program, and have it working as described by the author, go back and figure out how it works, and why it works. You'll soon find you can start to make additions to programs from books or magazines that help "customize" them for your own use. This is an ideal way to learn. My advice is to start at the very beginning, and use some feature of BASIC until you understand its usefulness and purpose. Continue to add on features as you need them or want to understand them. Above all, don't get frustrated. The best way to learn to program is to program. NOW TYPE RUN, AND PRESS RETURN. 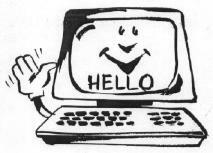 Your computer should print HELLO on the screen, followed by READY. Ta Da! A working program. Surely, you say, I bought this machine to do more than this. Of course you did. Let's turn our sample into a more useful program, adding a few more features common to all our BASIC languages. 20 PRINT "HOW MANY NUMBERS DO YOU WANT TO ADD?" 50 PRINT "ENTER THE NUMBER." When your computer asks how many numbers you want to add, type in some small number like 5. It will then ask you, 5 times, to "Enter the number." Each time, type in one number that you want to add to the sum. Here's what you should see on your screen after typing run. 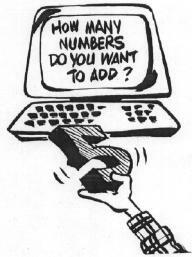 HOW MANY NUMBERS DO YOU WANT TO ADD? You press 5 and return. This will be the sum. Try this one out, and next time we'll expand it further, explaining how it works, and some nice ways to make it work more usefully.